Victor Reinz - the world leader in sealing technology! Increasing torque and performance with decreasing consumption and emissions. The development goals in engine construction determine the requirements of modern gasket systems. As a leader in technology, an original equipment manufacturer transfers all of his expertise, experience and quality into the replacement parts business. 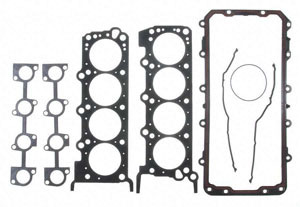 With a broad product palette, VICTOR REINZ supplies cylinder head gaskets for all conventional passenger car and commercial vehicle engines. Ford Truck V8, 4.6L, 1997-2000, Vin W, (Romeo made engine).